revival of that genre at DC Comics, and therefore in the comic book industry itself. What this debate ignores is the fact that Captain Comet beat both of those characters into print. 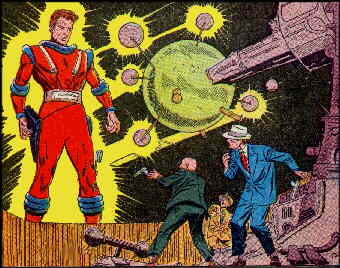 His first appearance was in Strange Adventures #9 (June, 1951) — only three months after the closing bow of The Justice Society of America, last bastion of many of the publisher's 1940s costumed do-gooders. His origin story was written by John Broome, who would go on to script many science fiction and superhero stories for Strange Adventures editor Julius Schwartz, and drawn by Carmine Infantino, who eventually rose in ranks to become DC's publisher and editorial director. The Broome/Infantino collaboration also created such diverse characters as The Phantom Stranger and Detective Chimp. Most later entries in the series were drawn by Murphy Anderson, whose credits range from Buck Rogers to The Atomic Knights. Captain Comet was Adam Blake, a man born 100,000 years ahead of his time — at least, according to the prevailing dogma of pulp-style science fiction, in which our species was evolutionarily predestined for a glorious future of mental and physical perfection. His friend and confidant, physics professor Emery Zackro, compared his condition to a throwback, that is, a creature in whom a chance combination of genes causes it to resemble an earlier form of its species. Adam was kind of a "throw-forward", or, as Zackro put it, a mutant. And that was another of Captain Comet's little-known distinctions. Predating Marvel's X-Men by no less than 12 years, he was comics' first mutant superhero. Adam's mutant status was attributed to an especially bright, previously unknown comet whose light had shone upon him minutes after birth — tho why the comet didn't affect others born under its glare was unexplained. His abilities included extraordinary intelligence and athletic prowess, clairvoyance, psychokinesis, and prodigy-level talent in many fields. These powers had gradually become evident as he grew up, but the first time he used them to fight crime was when a gang of thugs tried to steal an advanced electronic device Zackro had created. Following that, he made himself a costume to hide his identity and went into the business of combatting evil on a regular basis. His superhero suit was apparently intended to set the tone for the new, modern, '50s-style characters. Instead of the skin-tights of the 1940s super guys, he wore a slimmed-down, fancied-up version of an astronaut's pressure suit — which, while it hadn't yet come into use in real life, was already a familiar sight in sci-fi movies of the time. However, when the superheroes did start proliferating again, their outfits generally looked pretty much like the old ones. Despite the blandness of the character, with his generic super powers and lack of supporting cast or interesting motivations, Captain Comet continued to battle criminals, alien invaders and (like most 1950s DC characters) the occasional talking gorilla for the next three years. Then he started skipping issues, and finally disappeared altogether. His last Strange Adventures appearance was in #49 (October, 1954), after which he wasn't seen again for decades. In 1976, he turned up as a supporting character in DC's Secret Society of Super-Villains, explaining that he'd spent the intervening years exploring outer space. Following the demise of that title, he hit the guest star circuit. Later, he was involved with DC's L.E.G.I.O.N. series, a 20th century counterpart to the 30th century Legion of Super Heroes, then went back to guest star status when that series ended. More recently, he starred in a mini-series named after the old Mystery in Space title, which had for years been a series-less companion to Strange Adventures, but later featured minor series such as Space Cabby and Star Rovers, and major ones like Adam Strange and Hawkman. In this series, which ran from November, 1986 to June, 2007, Cap had been killed by a villain named Lady Styx, but his mutancy enabled him to survive in a disembodied state until he merged with another disembodied soul, that of a short-lived '80s superhero called The Weird; and together they created new bodies for both. The new version was done by cartoonist Jim Starlin (Warlock, Captain Marvel). Now calling himself simply "Comet" (no relation) and passing himself off as the nephew of the original, he's back on the guest star circuit. Text ©2001-05 Donald D. Markstein. Art © DC Comics.